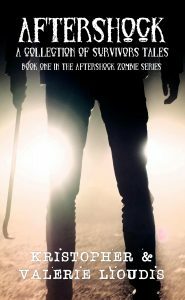 Buy her latest book, Aftershock: A Collection of Survivors Tales. XL: You are a mother of seven. I know my three are often a handful. How in the world do you find time for writing? Lioudis: I work in spurts throughout the day. All of my networking is done on my phone, but my actual writing has to be on my computer. That is tricky sometimes. I have been known to work in the middle of the night when everyone else is asleep. I get my best writing done at midnight. XL: You’ve worked as a reiki master? And as a gorilla gram? What are those, exactly? Lioudis: Reiki was part of my massage school training. It is a way to heal people with energy. I also learned principles of yoga, and Thai Chi. The only one that made me a “master” was reiki. A gorilla gram is someone who wears a gorilla suit and delivers you a gift. This was my favorite job i ever had! I was a mascot in high school, Go Lions! So, putting a costume on wasn’t foreign to me. I actually love the idea of making someone smile without them ever knowing it was you. The best were the looks I got driving away. 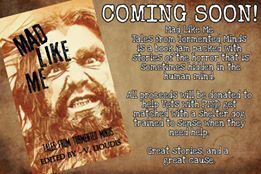 XL: Your book, Aftershock: A Collection of Survivors Tales, is told from multiple points of view. Was it hard to keep the characters straight? Lioudis: It is hard for me to keep my kids straight! Actually, no. Kristopher, my husband, and I split the writing duty. This made it a much easier prospect. My characters are also very different from each other. That helped. XL: The book is also told in a diary-type format. Tell me about that. What made you choose to write this story in such a style as opposed to a straight first- or third- person narrative? Lioudis: With a situation like the world ending, I really liked the idea of letting the characters tell their story. You get to hear what they thought and felt in any given situation. Without diary style, it would have been hard to do this in a way that each character gets equal time and importance. There is no real main character in our book. We wanted readers to be able to connect to the characters that they related to most, not ones we pre-picked for them. XL: One of your characters in Aftershock is an autistic man. How difficult was it creating such a character? Did you do any research into autism to aid in making the character believable? Lioudis: I would love to take credit for him, but Kristopher wrote his character, and he did a damn good job at it. XL: To you, what are the ideal writing conditions? Do you have a particular room where you write? Do you do anything to set the mood for writing? Lioudis: I wrote a few times at a Nanowrimo write-in. That was amazing! I drove to a quiet room at a local museum and wrote for an hour and a half s straight. It was glorious. I would do that more often if possible. That is why I started a local writer group. We have yet to meet, but the plan is to do a monthly write-in. Right now though, I write anywhere in my house that I can. The most common place to find me is at the dining room table with my headphones blasting music at an unhealthy volume. I need to be where the kids can get me, and somehow find a way to focus on stories. It can be difficult, but it can be done. I guess it comes down to how much you want it. I found my passion with writing. I never thought that would have been where my passion was hidden, b because I have always been a math nerd. It was an interesting discovery for me. It turns out, I love to tell stories. I love to write things that people enjoy reading. I hope to give people a small escape from the real world. 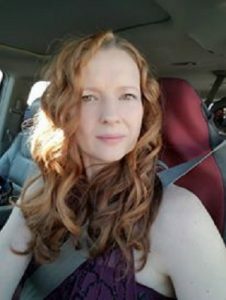 If I get really lucky, or maybe if I manage to write the story just right, they can find a character to connect to, a and want to read more. XL: What sort of preparation goes into a new story, be it a short story or a novel, before you sit down to write it? Lioudis: I am a pantser all the way. I fly by the seat of my pants in all my endeavors. I make lists because my memory is so bad, but not to preplan, more to remind me of the things I agreed to do. Sometimes, I worry that I am doing it wrong. Everyone else seems to have a process. I really don’t. I just write what I feel like, send it off to my editor for a quick grammar check, and then send it on its way. XL: What was it like writing with your husband? Do you think co-authoring with your significant other is easier than writing with someone else? 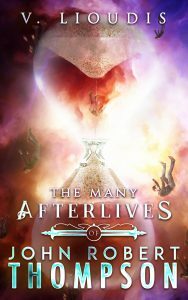 Lioudis: With the Aftershock world, Kris and I do a quick recap of what we wrote, and then we plug along on our own. We have to check in to keep things consistent, but we aren’t really planning out the book together. It was actually really fun. I know some people can’t give up control of the story like that, but I enjoyed it. I never really knew what would happen until after we wrote it. XL: Did you guys ever argue over what should happen in the book? Lioudis: Nope. We are really in sync as a couple. We don’t really argue about anything. Ever. It is weird, but nice. XL: For you, when does the rewriting process begin? What sort of changes or corrections needed to be made when you were fine tuning Aftershock? Lioudis: Kris did all the editing work for Aftershock. That was before I got my editor Jack from Readline Editing. I have a comma issue. I over-comma. And a tense issue. I change up my tenses as I write. As for the story, once it is on paper, I don’t really change it. XL: I know you’ve been involved with some anthologies. I’m betting the ones you are most proud of are those that benefit good causes, such as the Mad Like Me that will benefit vets with PTSD. Tell me about how you got involved with such projects and why they are so important to you. Lioudis: I am actually in charge of Mad Like Me. We are looking at an October release date. I felt like I needed to give back. Vets for Pets takes shelter dogs and trains them to help vets with PTSD. What could be better than that? The other anthology I am working on right now is the Reanimated Writers Undead Worlds anthology. Twenty-two zombie authors are all submitting stories based in their own unique world. For zombie fiction fans, this is going to be a good one. That book is due out in October. I love that we are able to introduce fans to new stories from authors they love, and maybe some new authors to love, too. XL: I know you are hard at work on Book Two in the Aftershock series. When are you expecting it will be finished? What other projects do you have on the horizon? Lioudis: Aftershock 2 is due out in October. Sheesh, writing all of this I just realized how booked that month is. I have another anthology coming out in September from the 30 Day Collective. The End is a book of stories about just that, the end. I was thrilled to hear that I had won their anthology story contest, and my story will be featured first. Treasured Chests is an anthology that Marc Moore of Good Morning Zompoc, a podcast based in the Uk, is putting together. The proceeds from that will go to Breast Cancer Cares a UK breast cancer charity. I wrote a story for that one and dedicated it to my friend Lisa, who was an inspiration to everyone who knew her. Lisa passed away from breast cancer, and anything I can do, even such a small thing as writing a story, to honor her, will always be something I can make time for.